Local leisure and recreation attractions focus on traditional family fun. Two miles east of town is Westlake Village, a golf course/lake community. The Winnebago County Fairgrounds are on the west side of town, adjacent to Sumner Park, a common meeting and excursion point for adventures on the "Pecatonica Prairie/Bike Path". To the west and across the river to the south is the Pecatonica Wetlands Forest Preserve, the 1047 acres of flood plain forest, oxbow pond marshes, and upland forest along the Pecatonica River. It is a favored fishing spot along the Pecatonica River. Special events at the Winnebago County Fairgrounds fill 3 seasons. The "PEC THING" in the spring and again in the late summer is one of the "hottest" junktique markets in the tri-state area. The Annual Main Street "Memorial Day Parade" is one of Illinois&apos; largest, lasting an hour and a half. Pecatonica also boasts their local youth sports program. Pecatonica’s early settlers first arrived in the area in 1835. Pecatonica’s name comes from the Native American word, “peeketolika,” which means, “crooked river.” A man named Dan Reed laid out the area, calling it Pecktonick. In 1852, speculative investors purchased the land from Reed and decided to change its name to Pecatonica. 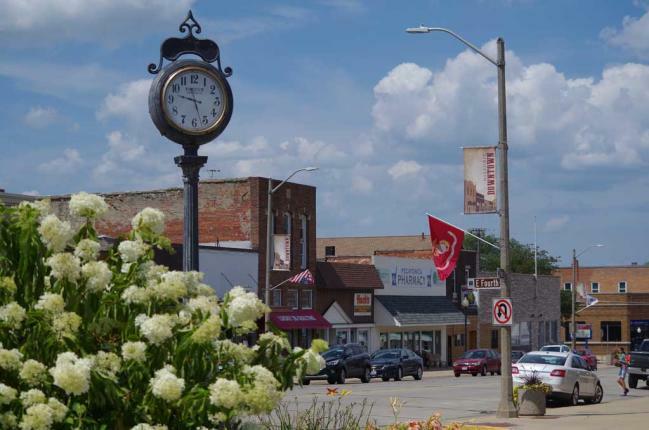 After that, the Village experienced rapid growth and was incorporated in 1869. Today, Pecatonica is home to the Winnebago County Fairgrounds, one of the best school systems in the state, several welcoming houses of worship, and an excellent park system that includes a nature trail extending from both sides of the Village on the old railroad bed.